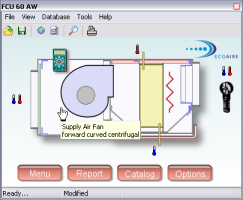 We have developed a selector interface that can accommodate any manufacturer's FAN COIL UNIT database. This program has been used in our various customer FCU selector programs. You create a database that includes your whole range. The program automatically reads your database and creates a custom entry form for your application. Now, your customer can select from your range of equipment with ease. The program even includes links to design tools like heat load calculators, psychrometric charts, water property editors. The interface has an interactive front panel. Click on the fan and see the fan curve. You can also allow users to edit fin spacing and include anti-freeze for water coils. The program generates an enquiry, making it easy for you to provide a quote.